So this last week Sean & I have been learning the ins and outs of buying a house. We even put a offer on one. But the owners wouldn't come down any on their price so we passed on it. It was literally straight across the street from a elementary and the island market and it has a stream in the back yard, huge back yard with lots of tree! But the house is over 100yrs old and is tiny. Altough it did have new siding, roof, windows & newer plumbing and electric. We thought about buying and adding on. But we talked to a contractor who said we could but with resale would would just brake even not get any equity. This was 1/3 of the yard the trees on the right line the creek. This is another 1/3. The fences in part is an overgrown garden that had irrigation and everything. Needless to say we have learned a lot. Now we are looking at our options of building a house instead. If it works out there is a lot behind my Mom's house that we might be able to build on. Not that living in my Mom's backyard is that exciting but it would be a great investment. We are looking forward to our FIRST family vacation, not counting going to either AZ or UT to see family. We are going to Breckenridge, CO May 22-29. We had planned to go river rafting and on a zip line and stuff like that. I have never done either and it looks like it's going to stay that way cause I went and got myself prego so now I can't. :( I am totally bumed about that. Sean bought a new mountain bike that he says is the best one in probably all of Utah. It better be for how much it cost. We could have paid off one of our cars! But in all fairness he sold his old one and some other bike stuff to pay for the new one so we really aren't out any money. It's just crazy to think how much his bikes are worth. And I would never expect him to live so close to the mountains and not have a good bike. Keilei LOVES being outside whenever she can, so we try and take advantage of the sunny days. It has snowed like 3 times in the last week! The weather can't make up it's mind. It is bright and sunny one day and snowy or rainy the next. Sean is having a hard time with the weather right now. He keeps saying it is only suppose to rain in August. He isn't used to actually having a Spring! I keep telling him it is spring, that is when it is Supposed to rain! So this has been the hardest season for Sean to handle, I thought winter would be. But I think cause the weather keeps changing it gets Sean's hopes up and then crashes them again, like a roller coaster. He wants to start riding, going up the canyon, and going to the lake! But then again locals start getting feed up with winter by Jan-Feb.
Well that is what we have been up to lately. We took Keilei to the park today and Sean was pushing her in the swing. He said Wee every time he pushed her and a minute later she started saying Wee too it was so cute. Then today we were leaving my Mom's house and she said Kayla ...well it was more ayla but close enough. Then on the drive to our house tonight she was playing Peek-a-boo, which she has done for a long time, but tonight she started saying it...which sounds like Bah-boo. But it was so adorable! I love that she is starting to say more things now. I was afraid she would be slow at that sense we use sign language so much. But she is doing good, and sign language is a life saver! She says Thank You all the time too, she has done that for a long time though. P.S. today at my Moms we were all watching tv and we heard the back door open and then we didn't hear anything else. We got up to check who it was and Keilei had opened the door and walked outside! If it hadn't of been so quiet we wouldn't have even known she had left! Scary huh!? 4 years ago today Sean & I told each other I Love You for the 1st time. 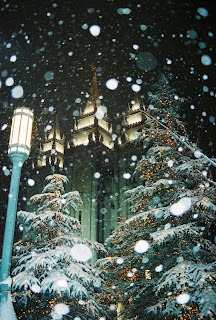 Remembering that I was in a senimental mood and started looking though my pictures and I love these pictures of the Temple. They are so beautiful on the outside but I am so grateful all the blessings they bring us. That I am able to be with Sean, my wonderful husband, and Keilei forever! On Sunday when we got home from church Keilei plopped down in the front yard and started playing with the little mini violets that grow in our yard. Sean & I just watched her. I told Sean I was afraid that she was going to get stung by a bee, they where all over in the flowers. He said she would be fine. I ran inside cause I had to go to the bathroom, for the 100th time. 3 mins later Sean brought Keilei in the house and she was screaming! I asked what happened and he said, can you guess..."She got stung by a bee!" I just shook my head, go figure. Sean took the stinger out, we gave her some Ibuprofen, and put some ice on it. She got stung on her right pointer finger and it got so swollen. Any time she used it she would cry. I felt so bad. 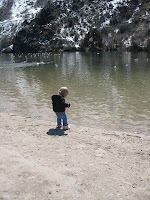 On Tuesday we went to the park and played outside. Every time she saw a bee or spider or bug she would curl her arms up against her body by her neck and start whining. A couple of times she would run to me and whine for me to pick her up. My poor baby was traumatized apparently. Hopefully she's not always like that. My family usually watches Easter Dream on Easter day. But on the Monday after my Mom always goes to the store and buys all the 1/2 off candy then makes baskets and fills eggs. 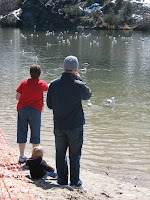 We drive up the canyon and have an egg hunt and a dinner at Guenava campground. I have always loved it and think I will carry on the tradition. I think it is a good thing to separate the REAL reason for Easter and the commercial part. Even though I am sure my Mom started it cause of the cheap candy since she had SO many kids. But it makes a nice Family Home Evening. There where a ton of eggs and only about a dozen kids so they each got a ton. This year was a little abnormal my niece, little sister, & youngest brother all brought their girlfriend/boyfriends. That has never happened at an family thing before, at least not with the 3 of them, and then to have three at once was crazy. I can't believe that they are all that old now. 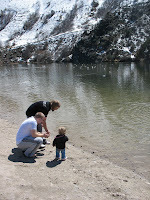 On Sunday between Confrences we went to 1st damn, at the mouth of the canyon, to feed the ducks. Keilei had a lot of fun. We had to watch her though she would just start walking into the water. She would also be standing and then just blop on to her bum and sit there in the sand and look at the water. Then she would get up walk a few steps and sit again. 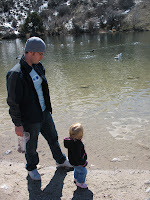 My Brothers Todd & Jeff played with Keilei trying to teach her to throw rocks into the water. My Mom, Lori, Sean & I were also there.